Boat diving gives you the best of everything about diving in the Cayman Islands. Access dive sites that can not be reached by shore divers and the dive sites that offer the clearest visibility, the most marine life and the convenience and safety of a fully equipped and staffed dive support vessel. Perfect for scuba divers who have already arranged their accommodations and just need to dive, dive, dive! You do not need to stay at Compass Point Dive Resort to dive on our boats. Many of our customers and repeat customers own a timeshare at Morritt's Tortuga Club or The Reef Resort and book their diving packages direct with Ocean Frontiers. The Classic Cayman Two-Tank Boat Dive is offered by Ocean Frontiers dive shop every morning and every afternoon except Saturday PM. This 1/2 day scuba diving trip includes 2x single tank dives at two separate and different dive sites on the East End of Grand Cayman, with a surface interval between the dives. Our pristine reefs and dramatic wall dives provide the ultimate adventure for the diver wishing to get away from it all. Ocean Frontiers dive shop offers scheduled Night Dives on Tuesday and Thursday every week. Lionfish Culling and environmental measures to eradicate this invasive species. Visit Grand Cayman's hot bed of Macro critters inside the East End lagoon. A dedicated ultra shallow dive to find the tiny, miniature, weird and wonderful creatures of the coral reef. A must for underwater photographers. 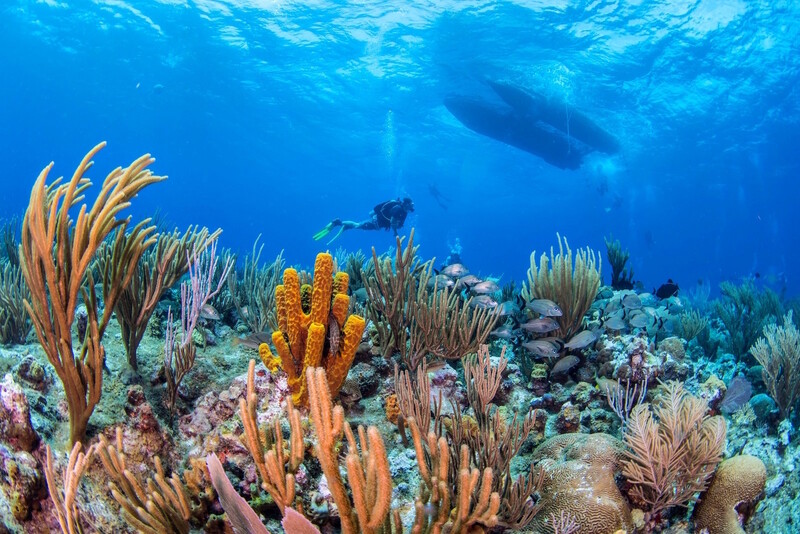 Visit Grand Cayman's first and biggest coral nursery and assist with hands-on tasks. This boat dive is a one-tank trip that runs every Wednesday afternoon. Includes mini-class with certification upgrade available. Head-To-Toe Scuba Rental Gear Special - US$35 Per Day or US$120 Per Week - Includes All Gear (Boat Diving Only) Leave your dive gear at home and take advantage of our 'Full-Set' gear rental rates. Includes: Mask, Fins, BCD, Regulator with Computer and a 3mm Long Sleeved Shortie Wetsuit if required. Lionfish Hunter certification class requires two Lionfish culling dives and supporting classroom sessions. Ocean Frontiers Snorkel Trips 3-Stop Coral Reef Snorkel Dawn Stingray Snorkel Stingray Sanbar Snorkel Private Snorkel Charters Please visit the other snorkeling information on these pages on our website or click on the links for each trip above. The 'After-Party' but with Stingrays. Enjoy a more relaxed Stingray encounter in the late afternoon golden sun, after the crowds have departed, followed by a boat ride home sipping bubbly and watching the sun set. Shipwreck Snorkel Snorkel the ex-USS Kittiwake, Cayman biggest and best shipwreck and artificial reef. 251 feet long and starting only 10 feet from the surface. A haven for marine life, a breathtaking experience. Price includes entry fee.